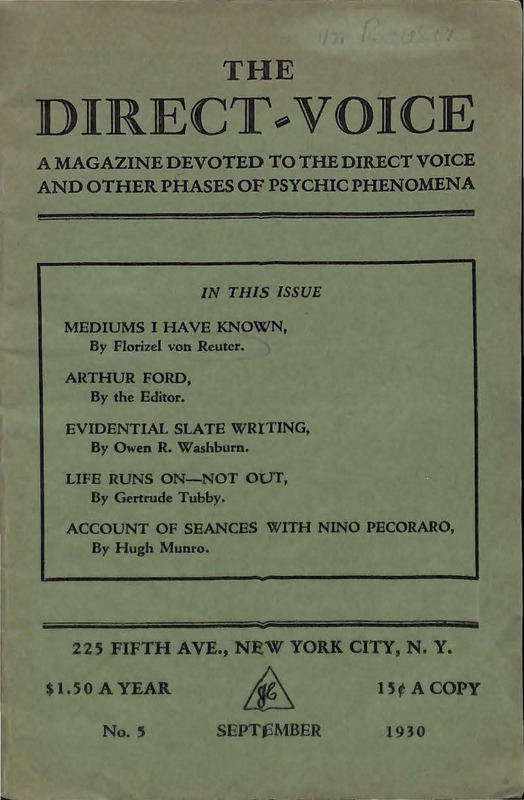 A magazine Devoted to the Direct Voice and Other Phases of Psychic Phenomena. New York, NY. Publisher: Sunshine Publishing Company. 1/1-6, April to October 1930. 32 pp., 6 x 8. $2.50 a year (reduced to $2.00 and then $1.50 as the journal faltered). The early issues, before money became tight, had semi-circles cut in the page edge to allow easy access to the journal's content. This was an anachronistic, old-time spiritualist journal (without the controversy) which the publisher tried to make current by including transcriptions of recorded direct voice communications from spirits such as "Camanche Chief Yeh-Yeh." The journal planned a series of articles on "Some Twentieth Century Mediums," but only got around to Miss Maina L. Tafe and Arthur Ford. Contributions by Frederick Bligh Bond of the ASPR, and by "Cheiro" and Will Goldson, the stage magician, on why he was a spiritualist. Articles on the modern-day spirit artist Francis A. Coll of Delaware, and on "Margery." The editor may have been Owen R. Washburn, who wrote most of the contents of the journal. A few advertisements appear, including ones for "aluminum trumpets" for spirits (reduced to $2.50) and the omnipresent ones for AMORC. NYPL and University of Manitoba; Skidmore, Lily Dale (4 issues).